A man tries to understand what happens to him when he enters the woods. Hopefully it’s just a simple parasite. A dark-comedy horror short about maintenance of form and involuntary transformation. Relax, It’s Probably Just a Parasite is a short experimental narrative (RT 5:30), animated entirely on a Buddha Board, a board where you paint with water. As the water dries, the “ink” disappears. The project started as an excuse to get away from the computer and work with something tactile. I had done a earlier experiments with the Buddha Board, including the short Experibuddha #2, and really liked the process. The image is inherently impermanent, so I knew I wanted to work with the idea of trying to have control over image (form) but not being able to maintain it. The writing changed a lot from Lovecraft-ean melodrama to a man addicted to dark rituals, to finally a hypochondriac infected with a “parasite” but it was always meant to be a somewhat over-the-top horror comedy. 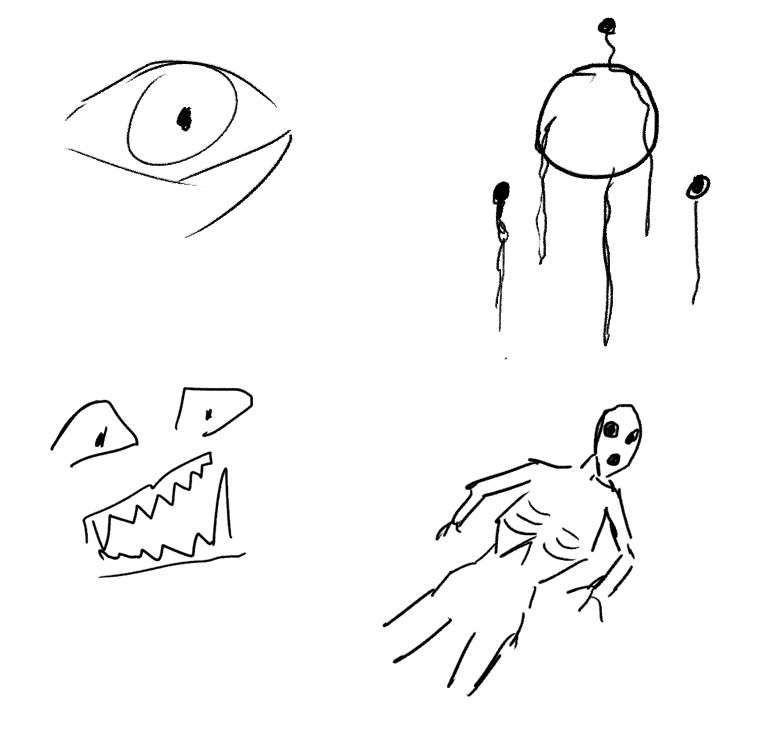 Animation was approached in several different ways. The majority was simply straight-ahead, painting the water with only some very very basic general imagery in mind as targets. I’d sketch out some thumbnails before starting painting/shooting and try and hit some main beats. The painting and shooting had to happen at the same time, since the very nature of the Buddha Board is that the painting becomes lost as the water evaporates. Here is essentially a time-lapse of the image drying, therefore disappearing. 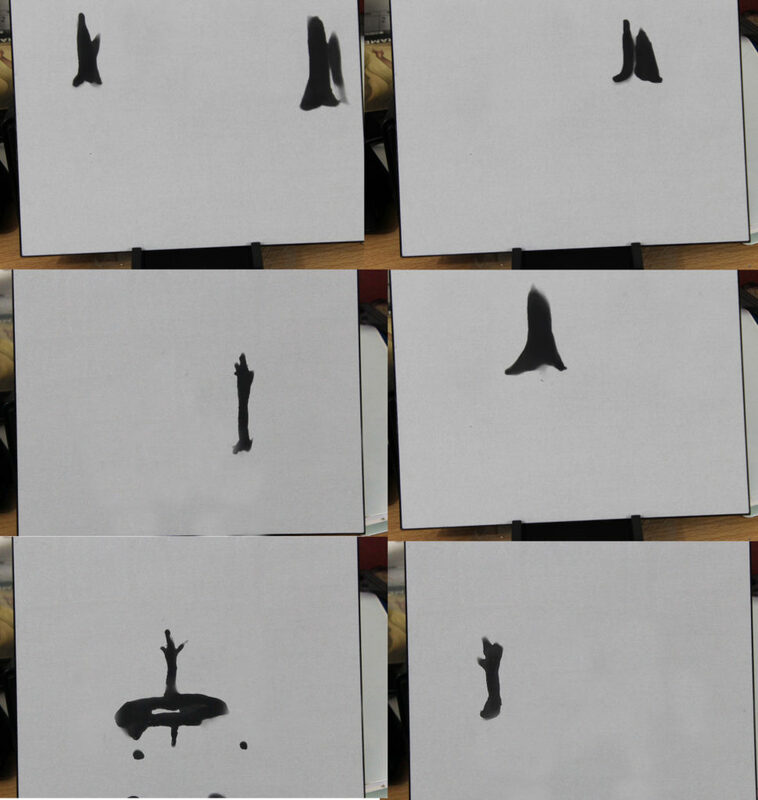 The “black” is just water painted onto the Buddha Board. A LOT of footage was shot, and a lot of it was just not very interesting. Probably for every 1 second of footage in the final version of the film there were 3 or 4 additional seconds shot and discarded. More complex images required several passes — sessions of painting and shooting. For example – a shot of three trees the circle, and several BG trees — it was impossible to paint everything in just one go before the water evaporated and the image went away. Shots like that required a separate animation pass for each tree, for the circle, and for the BG trees. This mean that very complicated images (especially involving the monster) took anywhere from 12-15 individual passes. Here’s an example — every sequence for each tree/s was painted and shot separately, then the animations for each tree were combined together later in compositing. Because some of the shots had fairly complex animation that would require my doing multiple completely separate painted sequences, I had to figure out a way to plan everything out. This meant that most of the shots had to be animated twice – once in a very rough way to use as a guide, then with the actual paintings. 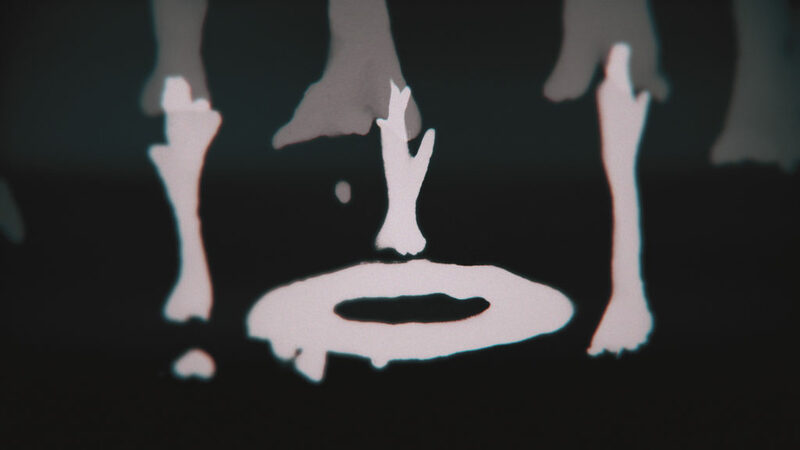 I then went through and rotoscoped on the Buddha Board the necessary passes. Here are some gifs. People love gifs. People don’t love figs. 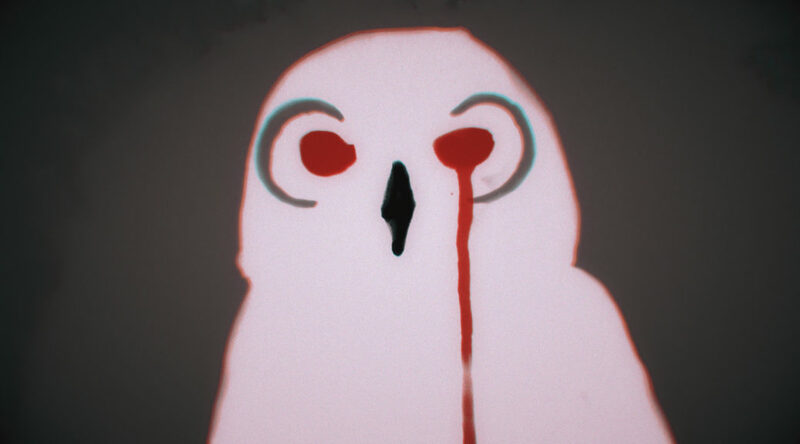 Each color of the owl represented a pass that had to be animated separately on the Buddha Board. The most complex shot (one of the monster) was only about 3 seconds long, but took nearly 40 hours to animate the motion guide, then all of the individual passes. A couple shots (CU of the hand, man’s walking in) I even tried shooting some video footage to rotoscope. Nice shorts, Joel. What a dork. Originally there were several shots of video footage of a couple of the animals that I tried rotoscoping as well. Those really stood out as rotoscoped in a bad way. Instead, I pre-animated the animals (like the 3D deer) or just animated straight-ahead in one pass (for example the rabbit jumping away). Music and sound design was all done by César Dávila-Irizarry. Check out his website here! He’s done some fantastic work, including the theme song for American Horror Story.